*Peaceful Bay Resort* is a bi-level resort features four two-bedroom units on each floor, each equipped with cable TV and DVD/CD players. One bedroom has a queen-sized bed and opens onto a deck; the second bedroom has two twin beds. Each unit has a washer and dryer. 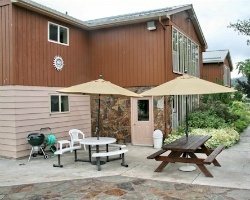 Seasonal amenities include a swimming pool and a boat dock. Hot tubs are available year-round. The town of Lakeside is just over a mile (1.6 kilometers) from the resort. Nearby are opportunities for playing golf in the warm weather and skiing in winter. 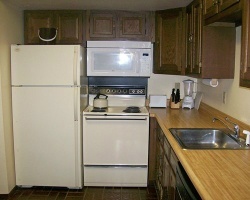 Great resort with fully equipped units! Enjoy all the comforts of home away from home! Annual week 1 usage! Inquire for details!